Description: later printings/release does not have cardboard slipcover. Caught between powerful forces and hunted down by genetically mutated citizens you come to grips with a mysterious and fascinating world that not only challenges your capacity to adapt and survive, but brings to question your values and commitments asking: Do you exploit the innocent citizens of Rapture to save yourself or do you risk all to become their savior? •Biologically modify your body: send fire storming from your fingertips and unleash hornets from the veins in your arms. 10-19-2017 tripredacus Description later printings/release does not have cardboard slipcover. 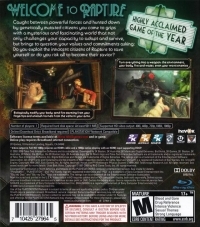 08-24-2011 solidgear3 Description BioShock is a narrative-driven action experience that allows players to do the impossible as they journey through an amazing, immersive and terrifying world. Caught between powerful forces and hunted down by genetically mutated citizens, the player will come to grips with the mysterious and fascinating world of Rapture, a distinct Art Deco underwater utopia gone mad. 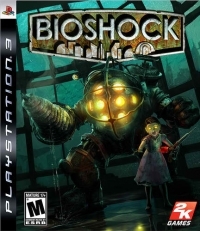 BioShock not only challenges the players' capacity to adapt and survive, but brings to question their values and commitment to the inhabitants of Rapture. With smart and adaptive AI, no encounter ever plays out the same, while numerous customization options provide gamers with an experience that adapts to their playing style.